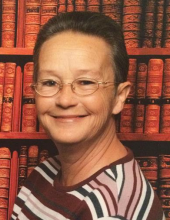 Norma Sue Christiansen, 61, of Kewanee passed away November 21, 2018 at Trinity Rock Island. Norma was born April 4, 1957 in Rock Island, IL the daughter of Elmer and Florence Fay Durbin Brown. She married Martin L. Christiasen, he passed in 2014. Norma worked as a CNA in the orthopedics department in Irving Texas and later as a housewife. She enjoyed sewing, baking, pottery, and cookouts. She especially enjoyed spending time with her family and cooking for them. Norma is survived by her father, Elmer; son Shawn (Sharece) Jones; step sons Chris Christiansen and Chico Christiansen; grandchildren Cheyenne and Shawn Lee Christiansen, Jayce Kepner and Hope Toms; sisters Connie Moyer-Brown, Wanda Young and Eloise Cleveland; brother, Robert (Geraldine Riojas) Brown. To plant a tree in memory of Norma Christiansen, please visit our Tribute Store. "Email Address" would like to share the life celebration of Norma Christiansen. Click on the "link" to go to share a favorite memory or leave a condolence message for the family.